I wanted to share a very special quilt with you all. 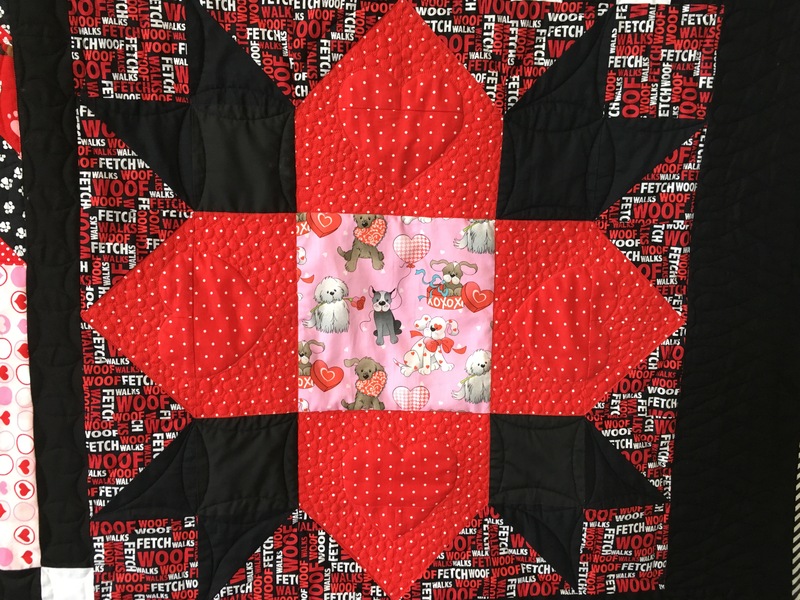 It’s made with the cutest dogs and they are perfectly placed in this Summer Solstice challenge quilt. 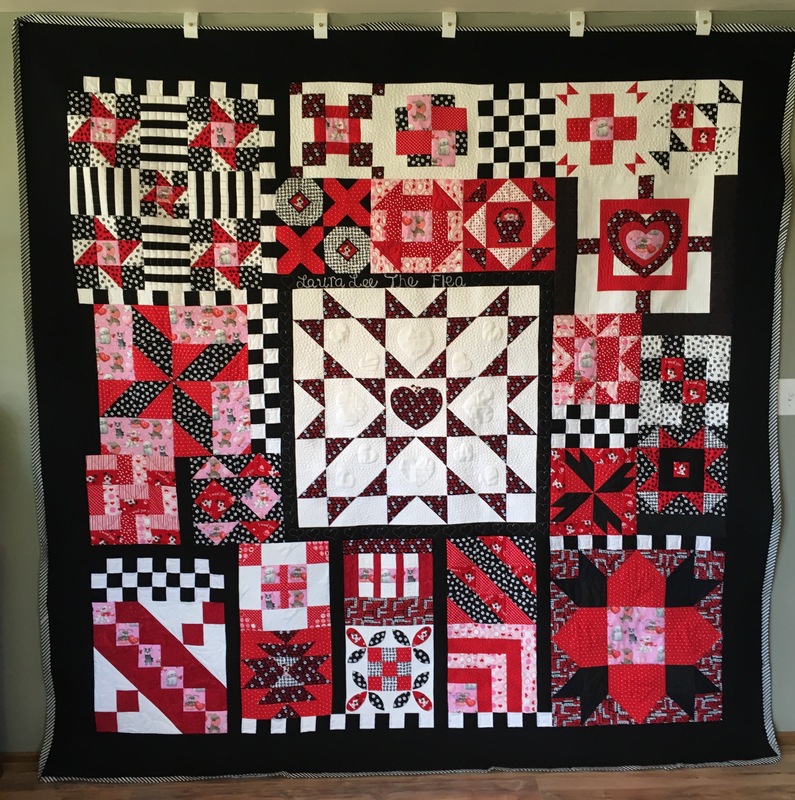 Kathleen carefully cut her black squares and assorted red and dog themed fabrics, from her daughter’s show shirts and dresses, she had as a child. 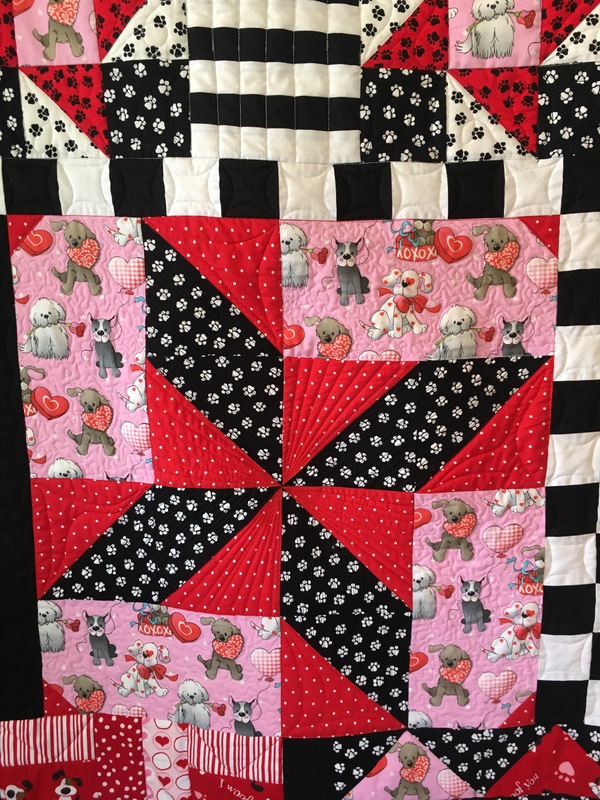 As this is a gift for her daughter, it’s such a beautiful experience to quilt such meaningful quilts, it’s like they speak to you with the memories of puppy’s and fun times with family. 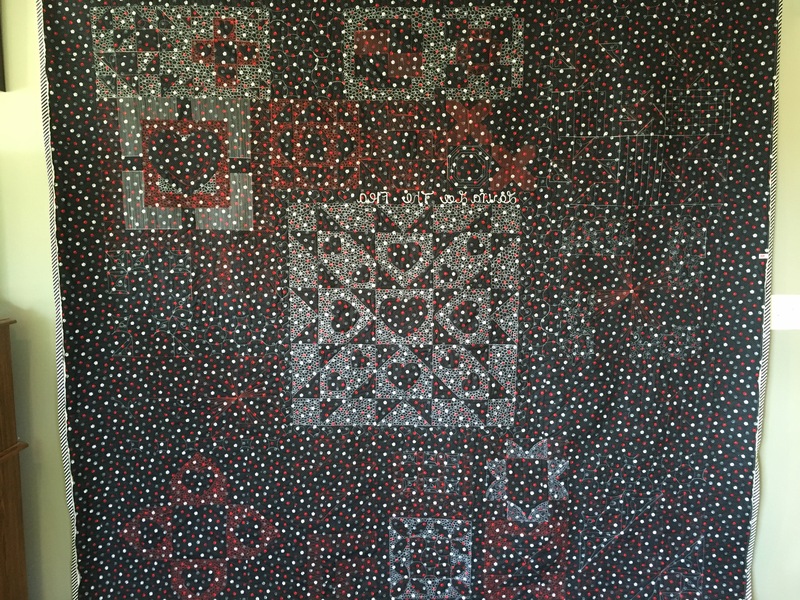 This quilt was pieced with so much love every block was perfect, you would have never known it was made with clothes. 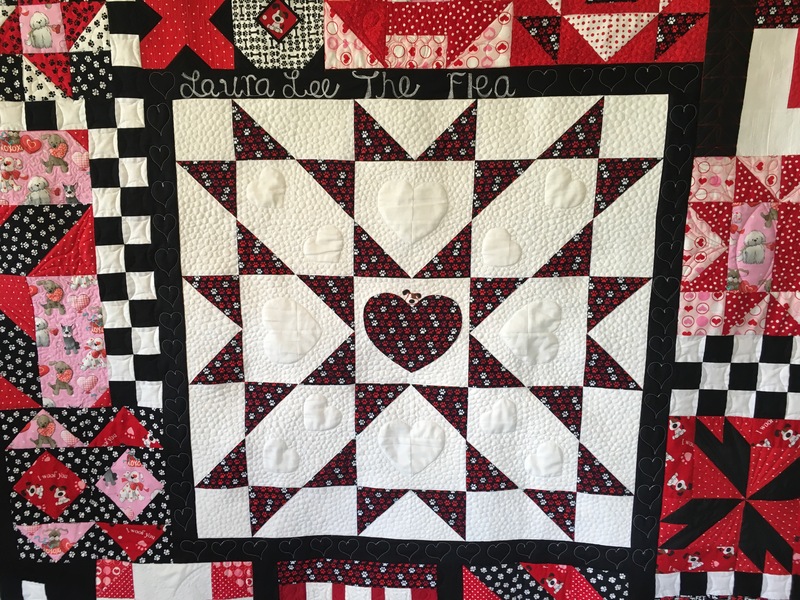 So to accent each block and it’s beauty, I decided to try and keep a general flow, so each quilting motif complemented each other. 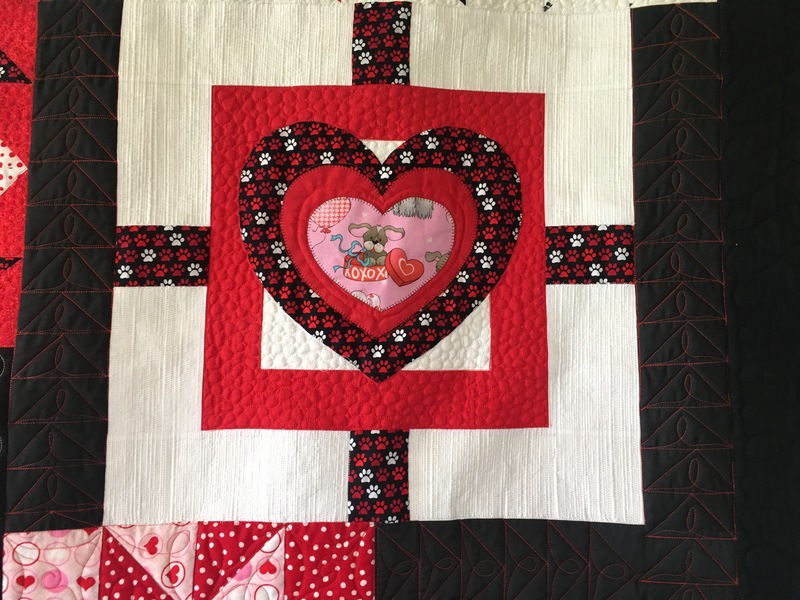 So I decided that free floating hearts would accent the large areas of some blocks beautifully with pebbling outlining the design. Then I stippled around the puppy’s, as who could quilt through those cuties, along with loops, zig zags and diamond peels followed by the main saying, Laura Lee The Flea which was a nickname her grandmother had given her as a child because she had such a love for dogs. I used three different color’s of Aurifil threads for top quilting, with a bleached Hobbs batting, it turned out beautifully! This was such a huge quilt measuring 98 inches by 98 inches but very unique in design, I hope you all enjoy the pictures it was hard to get the perfect picture of this memorable quilt. I hope you enjoy the pictures and little story behind this treasure. Thank you Kathleen for letting me be able to quilt your beautiful quilt and help preserve such beautiful memories!